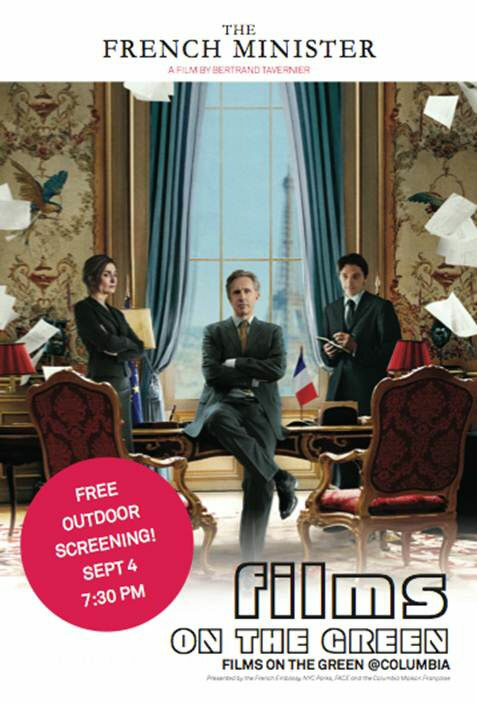 Films on the Green presents the free outdoor screening of THE FRENCH MINISTER by Bertrand Tavernier on September 4th (7:30PM) at Columbia University. The French Minister is based on the graphic novel Weapons of Mass Diplomacy by Christophe Blain and Abel Lanzac. The film is in French with English subtitles and is free and open to all. Started in 2008 in the community gardens of lower Manhattan and Harlem, the much-loved FILMS ON THE GREEN summer festival organized by the Cultural Services of the French Embassy, FACE Foundation and the New York City Parks & Recreation now shows ten films at six major locations: Central Park, Riverside Park, Tompkins Square Park, Washington Square Park, Columbia University, and Transmitter Park (Brooklyn). Films on the Green @ Columbia is presented in partnership with the Columbia Maison Française. In the event of rain, the screening will be held in the Maison Française, East Gallery, Buell Hall.